Can You Collect Unemployment and Social Security? Can you collect unemployment if you are laid off from a job, but are also collecting social security benefits based on your prior employment? Depending on where you live, you may be able to collect both full unemployment benefits and social security. Some states offset your unemployment benefits based on the amount of social security states you receive. In those locations, unemployment benefits are adjusted based on social security income. In other states, you can collect both social security and full unemployment benefits. Full unemployment insurance benefits are available for workers who are collecting social security in most states. 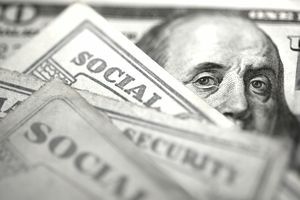 There are exceptions in some states where the amount of unemployment compensation is offset by some of the social security benefits that are received. Eligibility requirements to qualify for unemployment compensation vary from state to state. In most states, you can collect both full unemployment benefits and social security. In a few states, the amount of unemployment compensation is partially offset by the amount of social security payments that are received. In those locations, your unemployment could be reduced by 50% of your social security benefit. It is called the "offset law" and, in the states where it is in effect, part of social security payments are counted as disqualifying income when calculating unemployment benefits. While social security benefits might reduce your unemployment benefits (depending on what state you live), collecting unemployment compensation will never reduce your social security benefits. That's because social security only counts wages as income when calculating benefits. Unemployment is not considered salary and, therefore, it is not counted. If you are collecting unemployment and receiving social security, check with your State Unemployment Office for information on how your unemployment compensation benefits are impacted. You can either look up this information on the office website, call the office, or visit in person. There are also circumstances when you might be completely disqualified from unemployment benefits. These include insufficient earnings, being fired for cause, or quitting without a good cause. Other disqualifications include being self-employed or leaving to attend school. Click here for an even longer list of unemployment benefit disqualifications. If you file for unemployment and your claim is turned down, you can choose to file an unemployment appeal if you believe you should receive unemployment. The process varies depending on the state, but the general steps are the same. When you file an unemployment appeal, you will attend a hearing (an informal trial held before an unemployment appeals board or judge) and testify as to why you believe you are entitled to unemployment insurance benefits. Your former employer will also testify. Here is more information on how to file an unemployment appeal. Eligibility for unemployment, the length of time one can receive unemployment, and the amount of benefits received, vary state by state. The amount you will receive also depends on how much you earned at your former job. You need to open a claim to apply for and begin collecting unemployment. Here are step-by-step instructions on how to file for unemployment benefits. For more information, check your State Unemployment Office website for information on what's required to file a claim in your state. You can also read more information on how to claim unemployment here. One way to learn more about your social security situation, and how social security benefits might affect your unemployment benefits, is to create an “my Social Security Account." It is an online account run by the Social Security Administration. You can create an account whether or not you currently receive social security benefits. With an “my Social Security Account” you can estimate your future benefits and get an estimate on the social security taxes you have paid so far. You can also receive a benefit verification letter. This letter will state whether or not you are currently receiving, or have ever received social security benefits. It will also state whether you have applied for benefits but have not received them yet. The letter will also include the dates you have received these benefits.